The Ruyan V8, which produces a nicotine-infused mist absorbed directly into the lungs, is just one of a rapidly growing array of electronic cigarettes attracting attention in China, the U.S. and elsewhere — and the scrutiny of world health officials. Because no burning is involved, makers say there's no hazardous cocktail of cancer-causing chemicals and gases like those produced by a regular cigarette. There's no secondhand smoke, so they can be used in places where cigarettes are banned, the makers say. "There is not sufficient evidence that (they) are safe products for human consumption," Timothy O'Leary, a communications officer at the WHO's Tobacco Free Initiative in Geneva, said this week. The laundry list of WHO's concerns includes the lack of conclusive studies and information about e-cigarette contents and their long-term health effects, he said. Unlike other nicotine-replacement therapies such as patches for slow delivery through the skin, gum or candy for absorption in the mouth, or inhalers and nasal sprays, e-cigarettes have not gone through rigorous testing, O'Leary said. Nicotine is highly addictive and causes the release of the "feel good" chemical dopamine when it goes to the brain. It also increases heart rate and blood pressure and restricts blood to the heart muscle. 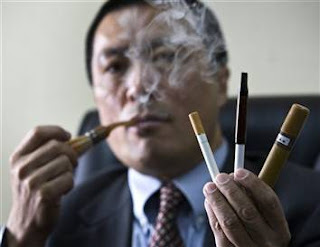 Ruyan — which means "like smoking" — introduced the world's first electronic cigarette in 2004. It has patented its ultrasonic atomizing technology, in which nicotine is dissolved in a cartridge containing propylene glycol, the liquid that is vaporized in smoke machines in nightclubs or theaters and is commonly used as a solvent in food. Hong Kong-based Ruyan contends the technology has been illegally copied by Chinese and foreign companies and is embroiled in several lawsuits. It's also battling questions about the safety of its products. Most sales take place over the Internet, where hundreds of retailers tout their products. Their easy availability, O'Leary warns, "has elevated this to a pressing issue given its unknown safety and efficacy."